Today we are announcing the pre-pilot phase of Microsoft Training Services, a digital, customized learning service for Office 365 and Windows 10 that helps customers transform their organizations without investing heavily in training and change management resources. Customizable, flexible content – Admins choose to hide or show content based on their environment or build their own custom playlists that are tailored to the unique needs of their organization. End users make their own playlists and share them with coworkers. Experiences sized to the customer need – Our service offers training playlist tools to be incorporated within their existing sites or the full Toolkit for Teamwork experience which can provide the end to end out of the box website for customizable adoption & training content. Always up-to-date content: Microsoft Training Services content is continually and automatically updated, enabling organizations to provide a library of up-to-date learning content for end users and avoid the hassle of having to make the changes themselves. Measurement tools – Management gains valuable insights into the training materials users consume and the types of custom playlists they create and share. No additional training resources or package purchases are required to use either the training content or full site experience solutions. 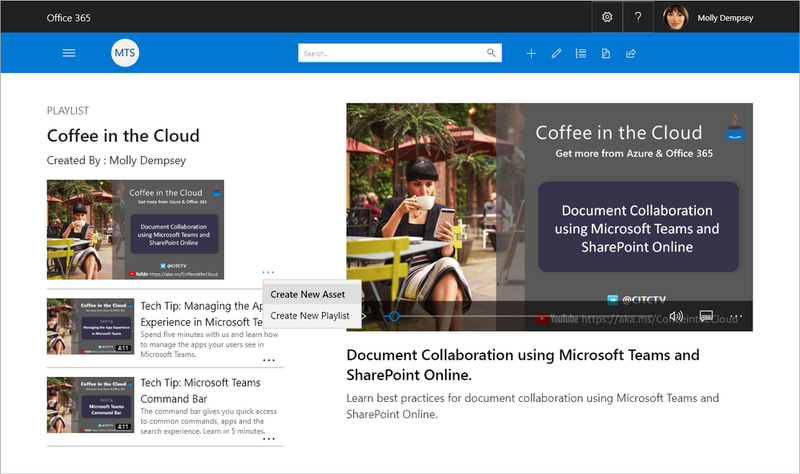 Microsoft Training Services delivers training content from an Azure-hosted content store to a Web part hosted on the customer’s SharePoint communication site. A similar package can be installed that will provide the full Toolkit for Teamwork SharePoint Online full site experience. Microsoft Training Services will be available as a pilot in late July 2018. To be added to the pilot waitlist or to learn more register at https://aka.ms/mtspilot.